Your livestock’s diet is our business. - Commodity Blenders, Inc.
with the quality feed you need. The right prices for the best feed. We buy corn. Lots and lots of corn. 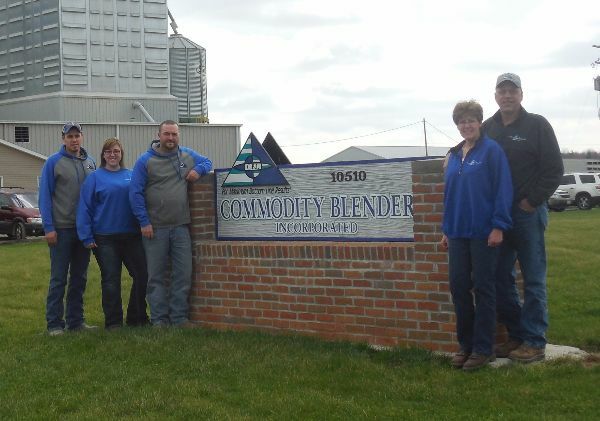 Commodity Blenders uses 1.3-1.5 million bushels of corn per year. Your livestock’s diet is our business. You want the right prices for the best feed, delivered on time, to care for the animals that are your livelihood. As an independent, family-owned, custom feed mill, we’ve lived the farm life for decades. We understand your needs and your concerns. We live and breathe the same dusty air, walk the same muddy paths, and rise on the weekends to keep on working with the livestock that don’t take time off for vacations and holidays. With that kind of farm life, you need a feed supplier that understands you and your farm’s needs. We work for you, and with your nutritionist, to ensure that you are getting the best results from your livestock. Because we are an independent feed mill, we’re able to offer you a wide variety of product choices based off of what’s right for you, not what’s most profitable for us. Our goal is to deliver to you maximum bottom line results with the quality feed you need. Are you looking for a better deal on feed and a more personal experience caring for your livestock? You could be saving thousands of dollars a year by working with our independent feed mill. It’s no joke that you’ve got other things to do besides find a new feed supplier, so we’ve made this real simple. Send us your formula and we’ll take care of the rest. Getting Started with Commodity Blenders, Inc.
After you send us your formula, we’ll prepare a quote so you know exactly what to expect working with us. We’ll follow up with you and your nutritionist to confirm the formula, prepare your first order, and discuss the details of delivery and payment. Over the next three to six months, we’ll work with your nutritionist to make sure that the feed you receive is delivering the results you want. When you have a question about your feed or your account, you can be confident that we’re here to answer those questions personally.